Developer Naughty Dog brings us back, once again, for another adventure of exploration, treasure hunting, and self discovery in their newest chapter in the Uncharted series. Uncharted: The Lost Legacy is a stand alone story taking place after the events of Uncharted 4: A Thief’s End in which you take control of series veteran, Chloe Frazer, while enlisting the help of Uncharted 4’s Nadine Ross to find the Golden Tusk of Ganesh in the wilds of India. With such critically acclaimed entries in the series such as Uncharted 2: Among Thieves, does the new chapter stack up, leaving it’s own legacy? Or does it get lost in the shuffle? In Uncharted: The Lost Legacy, we find ourselves following the story of Chloe Frazer, one of Nathan Drake’s “partners” from Uncharted 2: Among Thieves, as opposed to following Nathan himself. As we embark on Chloe’s journey, we find her in the Western Ghats of India, in search of The Golden Tusk of Ganesh, who is the son of the Hindu god of destruction, Shiva. Chloe doesn’t face this task alone however, as she has enlisted the help of Nadine Ross, who’s end goal is to use her share of the treasure to restore herself as the pinnacle of the mercenary group Shoreline, after her fall from power from the events of Uncharted 4: A Thief’s End. As with other titles in the series, I found myself invested in multiple story arcs through the game that kept me wanting to learn as much as possible as I played. Naughty Dog has done an excellent job of pulling Chloe into the foreground and developing her character as one that I felt a genuine connection to. Understanding her past and motives are just a few of the details that made me excited to learn more as the game continued, and I found myself trying to find as many optional dialogue queues as possible to learn even more about her. Chloe’s depth as a character is only to be matched by her charming and witty personality, which meshes perfectly with her dry, yet equally humorous counterpart, Nadine Ross. They complement each other so well in fact, that I would have assumed that they had been paired together many times before, as opposed to this being their first outing together. As Chloe’s partner and one of the protagonists of the game, I got to see an entirely different side of Nadine this time around. Nadine’s performance in Uncharted 4 was, I found, very stiff. Her role as the leader of Shoreline was what defined her, as opposed to this go around, where she is more human. She laughs, she gets angry, and she shows compassion. If you had told me this was what to expect from her, I wouldn’t have believed you, as they almost seem like two different characters. Chloe and Nadine’s relationship is extremely reminiscent of Nathan Drake and his brother Sam from Uncharted 4 and just works, without having to do too much briefing or hand holding for the player. While I was fully invested in the character development of the two main protagonists, the same could not be said for the overall story of this game. I honestly feel that the story of this game would have done just fine as a full on exploration game as opposed to a storyline requiring opposition. Enter the main villain Asav. As far as villains go, his motives seemed forced to tying in the Indian civil war aspect in the game, and his performance was equivalent to that of the civil war story arc; forgettable. As I said, having a villain, for me was not the driving factor making me want to continue the game, though it feels as though Naughty Dog was forced to add an antagonist to the game so they would have a reason to incorporate gun play in the game. By adding Asav’s element to the game, I only feel like it confused the main storyline for me and created unnecessary bumps in the road that got in the way of my enjoyment of character progression and exploration. Overall the game did a decent job of telling a somewhat interesting story. There were multiple times in the game where I thought we had reached the end, but the game continued to unnecessary ends. There is a fun link to the rest of the series that I greatly enjoyed, and that fans of the series will also enjoy, but I felt that it may have come too late in the game and made for a longer, more drawn out ending than it needed to be. Naughty Dog has brought back all of the core mechanics from Uncharted 4: A Thief’s End for Uncharted: The Lost Legacy, so if you have played any of the Uncharted games, especially their previous entry, you will feel right at home in The Lost Legacy. Minus a few hiccups here and there with Chloe not attaching to cover when I wanted her to, or Nadine getting in my way and not moving in a tight corridor, everything felt good. The gunplay is still a great design for a cover based shooter, and the exploration and climbing still feel smooth and natural. One of my favorite additions to the exploration aspect was the hook rope that was added in Uncharted 4. I love the way this makes you think differently about traversing a cliff side, or how to make a jump, even if the game does guide you into making those decisions. The “open world” portion of The Lost Legacy is something new that Naughty Dog has tried recently, in keeping with the trends of other modern exploration/action/adventure games. While it’s nice to have something to mix things up from a mostly linear campaign, I will say that the open world section, as a whole, felt too long. What Uncharted does well, is keeping linear gameplay interesting by mixing up environments and sequences. Insert a small section of almost, but not quite “open world,” and you bring the quick flow of the linear sections to a slow drudge of fetch quests and errand running. Uncharted: The Lost Legacy also includes the Multiplayer and Survival Modes from Uncharted 4: A Thief’s End, which allows those who did not pick up the last entry in the series an opportunity to experience them. Everything here is the same as it was in Uncharted 4 with a few additional player avatars and skins. I experienced The Lost Legacy on a PS4 Pro and what I experienced was something very special. Naughty Dog has continued with their tradition of creating beautiful set pieces, with stunning backdrops and incredible lighting effects. The game features a photo mode that allows you to turn off the HUD and experience the design in all it’s glory, allowing you to take screenshots as you go. They even go a step further and offer you different filters that you can apply to get different effects for your favorite photo spots. The attention to detail in the game is expertly crafted, with everything from the water splashing when a character runs through it, to the dirt, scrapes, and bruises on the characters after having been in the wilds of India for a while, the detail continues to impress. While I almost had a flawless experience, I did have a few times where textures popped in after the scene had loaded and a few camera pans that ended up with my view outside of the map. These were only minor and happened so infrequently that it didn’t affect my overall experience. Henry Jackman has done it again by creating a gripping, emotionally compelling soundtrack that perfectly captures the feel of the environments and keeps you on the edge of your seat during the most tense get-aways. 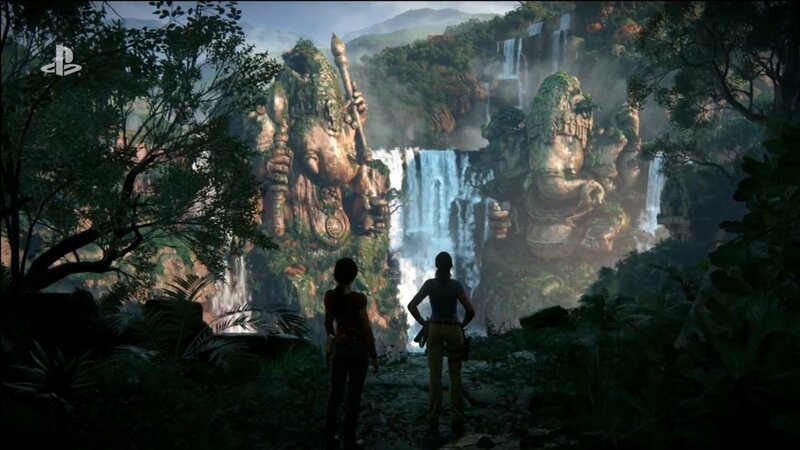 While I was slightly disappointed that I didn’t even hear an homage to the classic theme of the Uncharted series, I did like that Jackman and Naughty Dog chose to keep things familiar but different, allowing The Lost Legacy to create it’s own place out from behind the shadow of the rest of the series. Ambient noises of the wildlife around you make you feel like you are in the Western Ghats of India and the tense explosions and gunfire will have you looking for that shotgunner coming around the corner to take you out. Uncharted: The Lost Legacy slightly suffers from a fragmented story that can feel forced at times, with an antagonist that is forgettable and unmotivating. With a longer than necessary middle “open world” section, and gunfights that don’t seem necessary, The Lost Legacy could have done much better as more of an exploration based game rather than focusing on incorporating as many gunplay elements. The middle of the game seems more of a chore rather than something enticing for me to continue and I would rather have seen it shortened, even if it meant reducing the game to a four to six hour DLC. If you were a fan of Uncharted 4: A Thief’s End and are looking for more of the same, then Uncharted: The Lost Legacy is the game for you. While I would encourage anyone to pick this game up to experience the incredible character development and it’s unique and beautiful set pieces, I would recommend holding off until the game comes down in price, especially if you are not interested in playing the Multiplayer and Survival modes. That being said, I think Chloe and Nadine give spectacular performances and I truly look forward to their involvement in the franchise in the future.